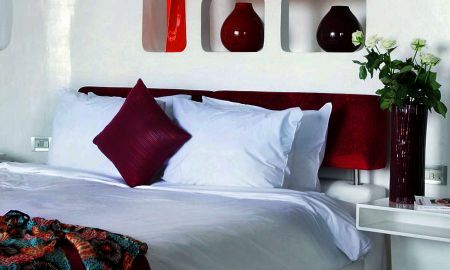 Elegant room with soft bed linen, bright shades and modern furniture. 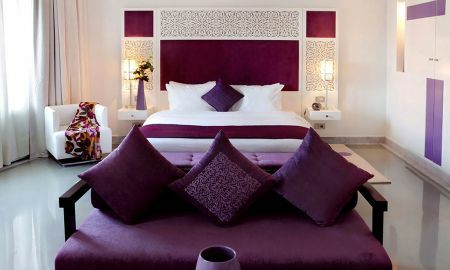 Spacious and bright suite, combining traditional Moroccan design with modern facilities to offer you a pleasant and peaceful stay. 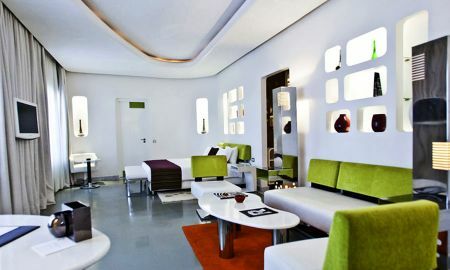 Luxury suite decorated in a very refined Moroccan style, with bright colours and design furniture. Suite designed in a style recalling the vivid and lively atmosphere of the 70's. 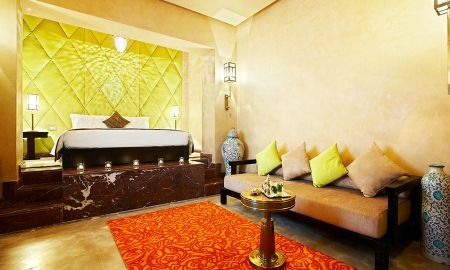 Located in Gueliz, in the heart of Marrakech, La Renaissance is a contemporary hotel featuring an attractive mix of European and Oriental influences, accentuated by a luxurious choice of noble materials such as wood, leather, copper and traditional Moroccan tiles. The rooms are all nicely furnished with a particular attention to details and a great diversity of light sources and colours, creating a quite and discreet atmosphere. Located on the 6th floor with views to the city and the Atlas Mountains, the Aqua Pazza restaurant is the perfect place to savour delicious Italian dishes. At night, relax at the hotel’s bar to enjoy succulent cocktails under the stars, in front of the illuminated silhouette of the Koutoubia. To forget the daily stress, join the Hammam for a scrub and massage session, or enjoy the warm sun of Marrakech in the panoramic terrace or by the pool. 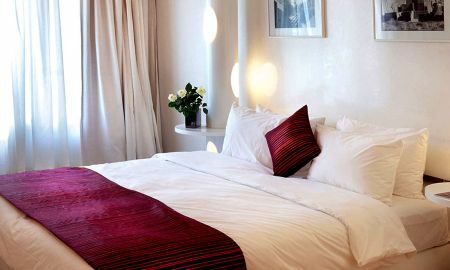 La Renaissance Hotel is located in the commercial district of Guéliz, at the corner of Avenue Mohammed V and Boulevard Zerktouni, amidst the modern shops and traditional bazaars of the famous square of Djemaa el Fna.